Charcoal is one of my most favorite drawing mediums. I’ve been using it since a couple of years, and I’ve come to love it more and more. Why? Let me give you five reasons why I love charcoal. I love the fact that charcoal is such an age-old drawing material. It’s been used for thousands and thousands of years, as the ancient cave drawings that most of us are familiar with show. These cave drawings have been found all over the world: from Europe to Australia and Southeast Asia. The walls of these caves are decorated with drawings made from charcoal, but also different types of earths and bone were used. These pigments were mixed with saliva or animal fat to act as a binder, so that they stuck to the cave wall. We don’t know why these drawings were made, if they had some ritualistic meaning or if they were just decorations. But it’s amazing that tens of thousands of years later we are still able to admire them. 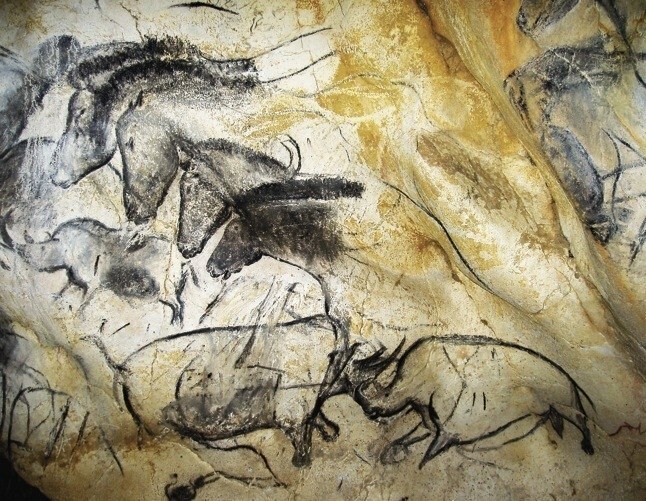 Look at these incredible drawings of rhinos and horses that were found in the Chauvet Cave in France (image below). These are the earliest known European figurative cave drawings, made over 30,000 years ago. Another thing that I love about charcoal, is that it’s a natural material and relatively safe for our health and environment. As a drawing material, charcoal in its purest form is made from branches of the willow tree, or sections of grape vine. 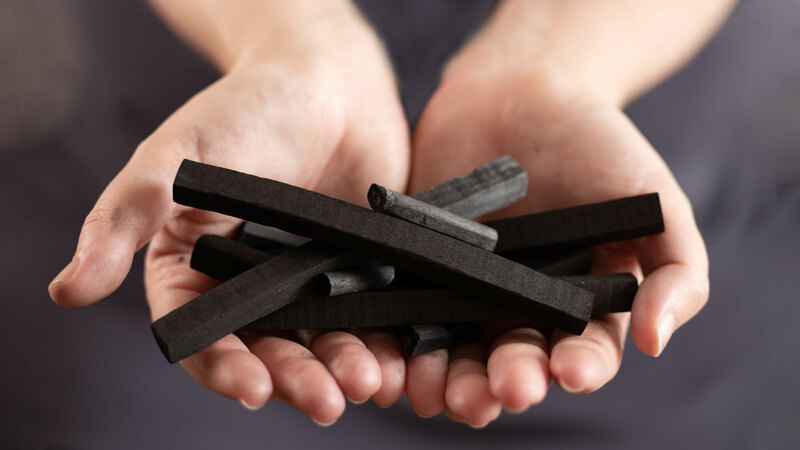 These are burnt to a precise degree of hardness, eliminating the oxygen inside the wood. 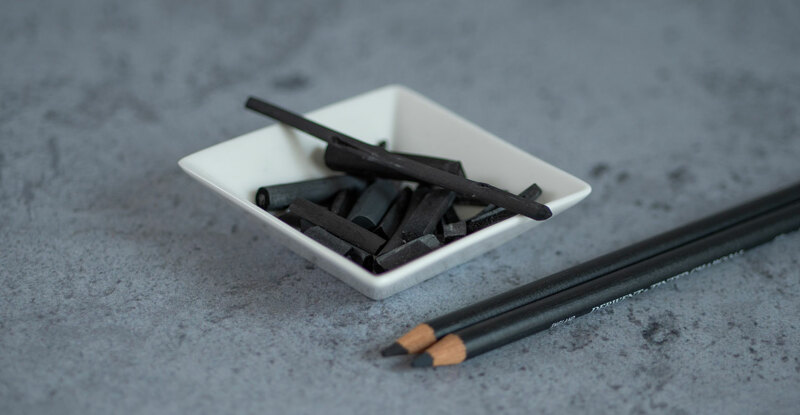 The more processed forms of drawing charcoal, such as compressed charcoal, use natural gums as binders, which are also generally safe for our health and the environment. 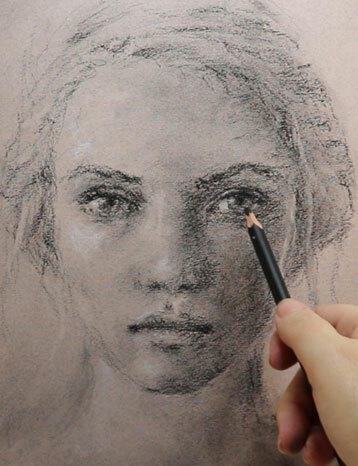 One thing however that you do need to be aware of, is the dust that can be produced when drawing with charcoal. Especially the variants without any binder, like willow or vine charcoal sticks, can produce dust when we draw with them. Important is that you don’t blow off the dust with your mouth, because you could inhale the charcoal particles. Instead, if you need to remove any dust it’s better to tap your finger to the back of your paper, or use a soft brush or a rag to carefully wipe it away. I also love the fact that charcoal is such a ‘basic’ material, which is not expensive at all. 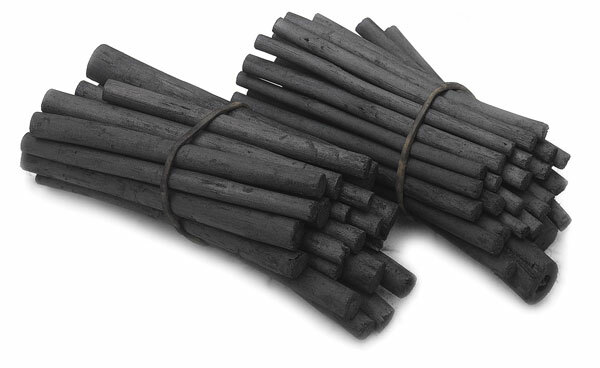 You can buy a pack of thirty willow charcoal sticks for less than 5 euros or dollars. Compressed charcoal and charcoal pencils aren’t expensive either. Add to that a kneaded eraser and a knife to sharpen your supplies, and you’re all set to create awesome drawings. No fancy tools or expensive supplies necessary! 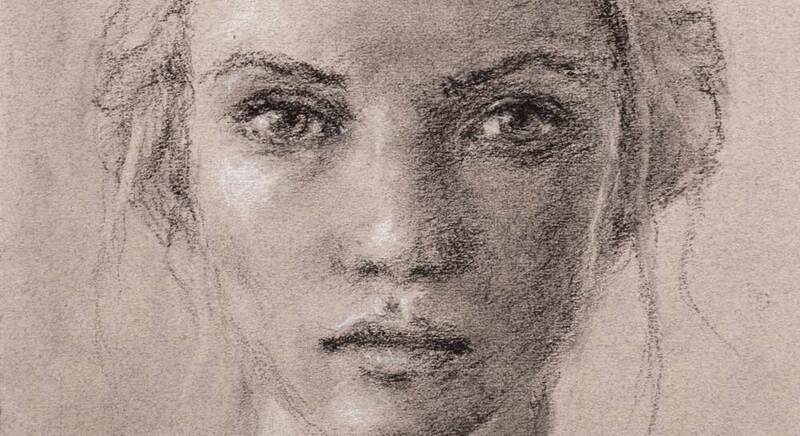 Charcoal is also an ideal medium to learn how to work with tonal values. Tonal value, or simply ‘value’, in art refers to how light or dark something is. The lower the value, the darker the object. If an object is light, it appears to be closer, and if it is darker, it seems to be further away. Tonal value is one of the most fundamental concepts in visual art, because it can be used to create depth and a 3D effect. Light and dark, or light and shadow, are the elements that give for example a face in a portrait its depth, its structure. That’s because the lighter parts of the face seem to be protruding, while parts that are dark seem to be pushed inward. The tip of the nose for example is usually light, because it is sticking out. Learning to work with tonal values in art is essential. It’s even more fundamental than the use of color. That’s because tonal values create the structure of your art piece. If you know how to work with tonal values, you can use any color and still be able to draw a realistic face. That’s also the reason that learning to work with tonal values is the first subject that we focus on in my in-depth portrait course Drawing in the Soul. Now, what does this all have to do with charcoal? Charcoal is a great medium to learn to work with tonal values, because it doesn’t have any color. Color can be distracting when we want to focus on tonal values, because it’s not always easy to see exactly how light or dark it is. If we eliminate the color, it’s way more easy to see the relative lightness or darkness of what we’re drawing. Charcoal doesn’t have any color, it’s just black or some type of grey. The light is created by the white of the paper. 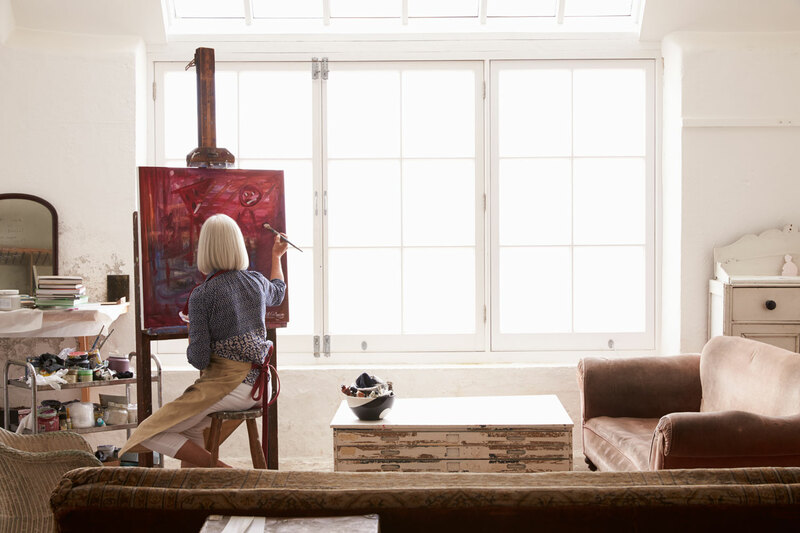 And that’s really all we need to create stunning portraits, with a lot of depth and realism. And finally, what I love about charcoal is its versatility. You can use many different techniques and create different looks with charcoal. In my online portrait class The Many Faces of Charcoal we’re going to explore this versatile quality of charcoal. We’ll be using a variety of charcoal techniques, to create portraits in different styles. 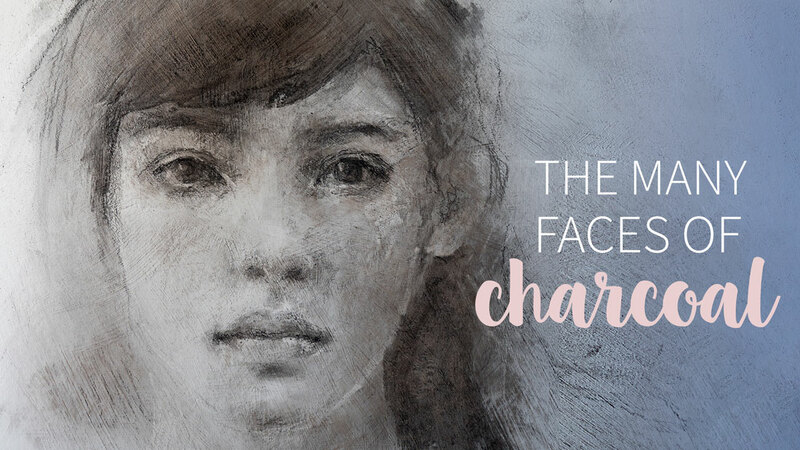 If you want to learn how to create expressive faces with a variety of charcoal drawing techniques, then this class is definitely for you! I could go on and on. Charcoal really is one of my most favorite art supplies of all times! And what about you? Do you like working with charcoal? Have you used it before, or are you new to this medium? Let me know in a comment below, I’d love to hear what you think of charcoal! I’m a total beginner! Just started drawing and FINALLY found something I enjoy doing. Lost my husband to brain cancer in 2013 and although I’m finally able to breathe again after 5 1/2 years, could never seem to find anything I enjoyed doing. Can charcoal be used for sketching then painting? Or are pencils better for sketching faces or portraits? I’m so so sorry to hear about your husband Robin. <3 But I'm really glad that you found art. 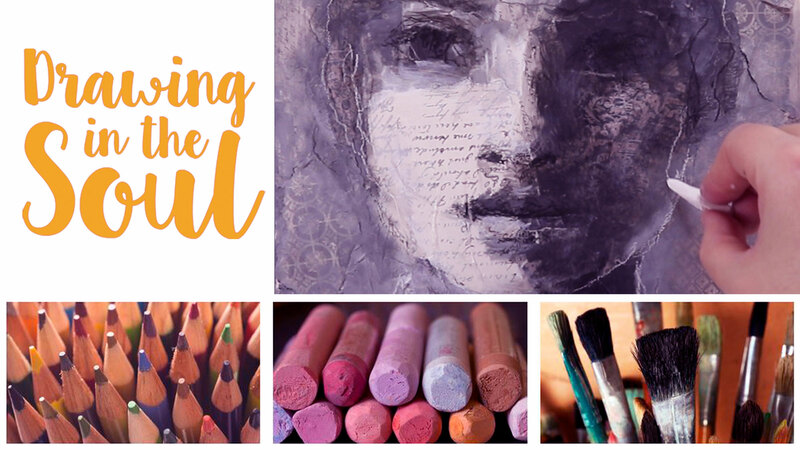 Yes, it can be so healing and such a beautiful way to express something from within. That's really precious! 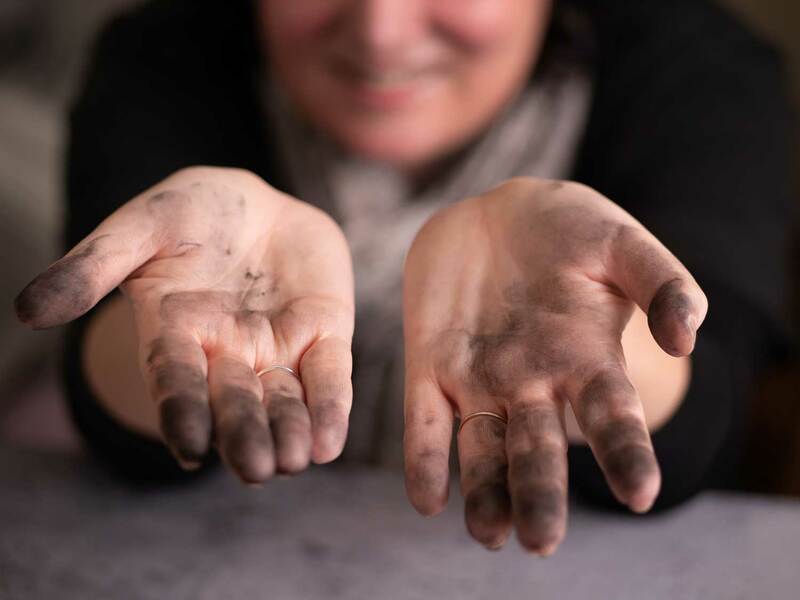 Hi Juna – Am really looking forward to learning all about the techniques of using various types of charcoal. I have played with some before, but your style looks very free and expressive and I would love to achieve even a little of that! Love Juna and her beautiful portraits. Trying to get even close to her own creation. Thanks a million in advance. Just awesome and so pleasing to ones Soul to observe. I have worked with charcoal some and have found it very enjoyable. I live in a small studio apartment and love that I don’t have to get out a lot of supplies. I enjoyed your classes in LF 2016 and look forward to your charcoal class. Have only drawn with charcoal once and that was in your Drawing in the Soul course. I loved that course and the way you teach. I’d love to join the charcoal drawing class, if not this session then perhaps the next one. Thank you.